Saw this at a car show last week. Wish I still had mine. A "Classic" to say the least! Did you get any interior shots, if so I'd love to see them. Thanks for sharing! Second new car I ever bought was a 57 Chevy. It was also one of the best I ever owned. Thanks for showing. What a beautiful money hole that is! no interior shots. It was factory interior and pristine. big engine, but still plenty of room to take a nap under the hood. 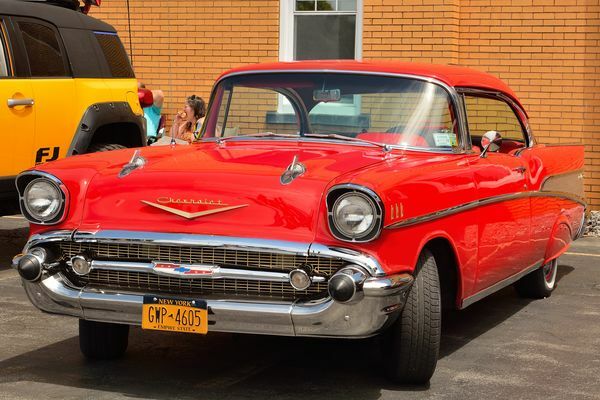 I traded my beloved 1950 Ford 2-door Sedan and some cash for a 1957 Chevy, 4-door hard top Bel Aire and I loved it! I wish I still had both vehicles! I had a '56 Bel Aire convertible, turquoise and white, V8. I paid a few bucks more for it. Great looking car. Very good shot Brent, one of my favorite cars. 1965, away from home for the first time at college. Bought a 1954 Chevy two door for $50.00 cash. Sold it two years later when I entered the Army. Got $40.00 for it. Damn. Very nice capture of a classic! Love the pics of classic cars! Tis a beauty! Keep'm com'n…..